The cluster of MERS cases at King Fahad Specialist Hospital in Buraidah we've been following since the middle of last week has jumped from 5 cases to 11, with the addition of 6 new cases today, including 2 HCWs and 2 patients, plus 1 Primary (Camel contact) and 1 under investigation. Two other cases are reported from around the Kingdom today; 1 in Alrass (Primary - camel contact) and 1 in Alzuffi (Primary). 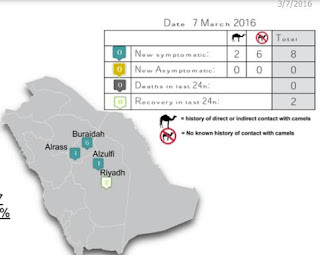 Despite a statement yesterday by the MOH, the particulars surrounding the Buraidah outbreak are far from clear; some cases appear to be nosocomial, while others are listed as `Primary cases' - either with, or without, camel contact. The pattern we continue to see out of Saudi Arabia is that of sporadic community acquired `primary cases' and occasional household clusters that all too frequently spark large nosocomial outbreaks. Last month, in MMWR: A Large Nosocomial Outbreak Of MERS In Riyadh - Summer 2015, we looked a just such an incident involving more than 100 patients that spanned more than a month's time. Unless we get a more detailed report on the Saudi MOH website, we'll probably have to wait for a WHO report to untangle the events in Al Buraidah. 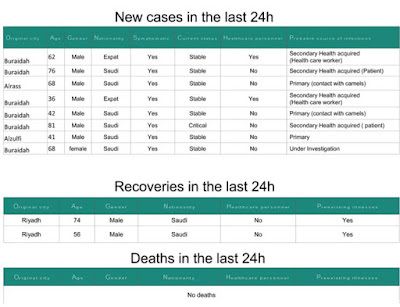 The last WHO GAR report was for Saudi MERS cases through Feb 16th, meaning there are now roughly 30 cases to catch up on.